This year, we have updated the Medal Requirements to include team collaborations as a silver medal requirement. To help facilitate collaborations, we have made this page so teams can share information about ways they wish to collaborate to reach all of the 2017 iGEM teams. Please note that this is a page for teams to advertise their collaboration requests. This does not guarantee that participating in one of these will fulfill the silver medal criteria. It is still up to you and your teammates to convince the judges that you have participated in a meaningful collaboration as stated on the Medal Requirements page. Tell us about your Collaboration Request by sending us an email to hq AT igem DOT org . Brief Collaboration Request description. This can be something that you can offer other teams or something that you are looking for from another team(s). Please help our team by taking a short survey about underfunded labs. iGEM teams who help us out will be entered into a drawing for a flash drive with the 3-d designs and software for our Chrom-Q. 75. Fill out a survey and lose weight! Obesity is becoming an increasingly serious problem all over the world. This year, NJU-China has developed a targeted therapy against obesity. We are hoping to get your feedback in order to understand the public perceptions of obesity. Your privacy and security will be protected. What’s more, we are also seeking help on modeling and human practice. Just feel free to contact us! Peking iGEM is now hoping to cooperate with researchers and students enthusiastic about synthetic biology, to build a wiki-based encyclopedia exclusive for synthetic biology – SynBioWiki(http://www.synbiowiki.com). Our long-term goal is to make it a knowledge repository organized in the interdisciplinary view of synthetic biology, and form an open idea sharing community with active social functions based on this website. We are team BNU-China, and we are conducting a comparative study on the motivation to participate in the iGEM competition between Chinese iGEMers and iGEMers from other countries. Questions of this survey covers these scales, Task Value, Self-Efficacy for Learning and Performance, Test Anxiety, Rehearsal, Elaboration, Organization, Metacognition, Time and Study Environment Management, and Effort Regulation. Since the questions covers varied scales, it might take you 5-10mins to finish this survey. Results of this survey will be presented on our wiki page, and you can compare your motivation level and learning strategy to the baseline we get from the data collected. In this way, you can review on your current states. We're truly thankful for everyone that fills out this survey. Besides if you have any suggestions or intend to help us collect more data within your local iGEM community please contact us at sylyu [AT] mail.bnu.edu.cn, so that your team could be included in our collaboration part. 3. We have made some handout for fresh water fish farmer, and we hope you can help us to district them. The iGEM Team Freiburg has created a survey to ask you about cancer and immunotherapies. These information are very relevant for our project. We would like to reach as much people as possible, therefore we would be glad if you could participate and spread the survey for us. This year, we cooperate with the 2017 iGEM team: Calgary to publish Newsletter of 2017 and we are responsible for the team in Asia. Creating this newsletter with the hope of bridging communication between teams to foster more collaboration opportunities. You can introduce your team, your project, your experiment, human practice and whatever you want other teams to know. It's also a good choice to put you collaboration information here to find a suitable team for help. If you have any questions or advice, please do not hesitate to tell us and attach your team logo with the materials. 69. Team Minnesota Biological Safety Collaboration Survey! We are Minnesota iGEM and we are making a booklet on different safety systems that we use to ensure the safety of the synthetic biology systems that we are working on. Examples of safety systems include, but is not limited to, antibiotic resistance plasmids or auxotrophy systems. This is intended to be resource for the future if you are considering a hypothetical release and what wish to understand how to safely go about it or just to improve the safety of your project. It is of the utmost importance to consider safety precautions and implement them into the project beforehand. 68. !!! Directed Evolution and Artificial Intelligence Survey !!! We, the iGEM Team Heidelberg, want to integrate YOUR OPINION on directed evolution and artificial intelligence in our project. Therefore, we created a 3 minutes survey to get an impression on how you think about our project to receive new input that we can integrate into our work. We are Amazonas_Brazil team and this year we are going to work with CRISPR! We intend to develop a simple and standardized methodology for this novel technique. Beyond the bench, we want to communicate with other teams that already worked with CRISPR in their iGEM projects, so we can understand a bit more of how was this experience and what were your difficulties. Thus, we developed a survey and we would be grateful if you and your team could collaborate with us. Have a nice iGEM season! Our high school is planning a trip to China to include Beijing and Shanghai in June of 2019. We are looking for potential teams to meet-up. We are traveling with a tour group, but would have an afternoon and evening open. (potentially June 6 in Beijing and June 12 in Shanghai.) Are any high school or collegiate teams willing to tentatively plan this? We can plan to meet and talk about it at the Jamboree. Our team is currently working on making Gibson Assembly more affordable for scientists by constructing the plasmids for DNA ligase and DNA polymerase and using Escherichia coli​ DH5α and BL21(DE3) machinery to clone and express these components on a large-scale. The affordability aspect will be achieved by using the cell lysate ratios as substitutes for the purified DNA polymerase and DNA ligase. The optimal cell lysate ratios will be determined empirically and once the magic ratio is found, we will attempt to assemble a plasmid with known properties and a known sequence. What we are looking for in this collaboration is to test out our method. We are open to sending materials to the collaborating team to perform tests in their own lab and share their findings with our team. However, we prefer receiving a vector and insert to perform the tests and assemble the plasmid in our lab. If the assembly is successful in our lab, we may ask the collaborating team to replicate the findings in their respective lab. The information required from the collaborating team is a plasmid map and a detailed description of the plasmid properties in vitro and in vivo (if applicable). Both teams' wiki pages will report the results of the collaboration. This is high school IGEM team: Worldshaper-Wuhan. We are currently doing a survey to find out how much do people know about colorectal cancer and what are their opinions toward colorectal cancer screening as well as other cancer-related problems. However, we have a few problem with the sample size, the questionnaire finished is 333 for Chinese version one, and, sadly, only 4 for the modified version 2. We want to see how different people answer the survey, therefore we need your help to answer the survey. We don't expect you to send the survey around to your friends, because if the sample size goes too large, it would be hard to re-organize and analyze the results, and we don't have student in our team that is expertised in computer science. The link for English version is https://www.surveymonkey.com/r/JDXZ3F5, and the one for Chinese version is https://www.wenjuan.in/s/32YZri/. If there are any problem with the grammar and survey design, please feel free to tell us. In addition, please send an email to zccy2001 (at) hotmail.com , stating which team you are in if you submit your answer. We will be counting it as collaboration.Thank you for your help and hope you have been successful with your project. See you on Giant Jamboree. 63. Can you measure Hydrogen gas production? We have cells which produce Hydrogen gas. We are quantifying the gas production and would like another team to do some measuring for us too. Perhaps you have access to a different method of measuring gas production. We are using a Clarke electrode. 61. Lead Contamination in YOUR Drinking Water? We are asking for contribution to our human practices through assistance in collecting information about lead contamination worldwide. 60. Help us beta test ProtoCat! My name is Drew Manson. Michigan Software is looking for teams to help beta test the latest version of our software project, ProtoCat! ProtoCat is an online protocol catalog, and we are looking for feedback on version 4.0. If you are interested, access ProtoCat at protocat.org, and use this survey link to evaluate the software (https://goo.gl/forms/3VmFYMpRPCKHa2YD3). Please send me an email with the subject 'ProtoCat Beta Testing' if you have any questions! For our project, we are dedicated to finding an improved treatment option for prostate and cervical cancer. Our team has drafted this survey to gather your and the general public's input, as well as constructive feedback, to improve the implementation of our project. We would greatly appreciate it if you can take the time to fill out the survey. Furthermore, if you would like to get further involved in helping us distribute this survey to the public, please contact us via the information given above so that we may discuss this collaboration further. 58. Augmented Reality App - QR-Codes at your stand! There has been an incident at the iGEM Giant Jamboree 2017 in Boston and numerous young scientists have been contaminated with some of the most dangerous viruses of our time! We, team Franconia from Würzburg and Erlangen in Germany, made up this scenario. Right now we are in the process of developing an augmented reality game for smartphones which will make it your task to combat the quickly spreading pathogens together as one large team during the Jamboree in Boston. In order to do that, you will have to look for QR codes placed all over the conference center which will help you produce antidotes for the pathogens. But beware: Viruses are hiding behind some of the markers to infect you too! Our goal is to have all pathogens eliminated by the end of the conference. To achieve this we need the support of your team: Would you be willing to attach a small QR code (approximately 4 by 4 centimeters [1.5 by 1.5 inches]) to your stand? This would make it possible for the other players to find more antidotes in order to combat the viruses. We would be very happy if you would join us in the hunt for the deadly pathogens. If you would like to collaborate with us or have any questions, please do not hesitate to get in touch with us! We are iGEM Team Munich from Ludwig-Maximilians University and Technical University of Munich and we did the online survey to gain more opinion about diagnostics device, so we would like to ask you to please fill out our survey below! We previously did scraping of the iGEM team database for the abstract and the title. We want to visualize it to see which teams did projects on common topics and we think this visualization will help us to easily find past and present iGEM teams working on different tracks based on the keywords you are looking for. Collaboration description: We would like to provide help to the others teams by joining the collaboration webpage. We launched a Survey about our project to better understand people needs and this way, providing better applications. In that extent, we would like to know whether it is possible to share our Survey on this collaborative webpage. We aim to introduce to the competition a new bioscreening system allowing to improve bioproduction through enzymes. As a proof of concept we decided to focus on Psicose bioproduction : a sugar with interesting properties regarding Diabetics. Thanking your in advance for your consideration. Collaboration description: We've made a first for iGEM - a voice assistant that runs on Amazon Alexa and Google Assistant. Compatible devices include the Echo, Echo Dot, Echo Tap, Echo Show, AVS devices and Android phones running Marshmallow or later and Google Home. Synthetic Biology Bot can search the iGEM parts registry as well as lead you through synthetic biology protocols step-by-step. We really want your feedback on any bugs you find, any extra features you'd like or just how you found the experience in general - you can contact Adam at a.jones [AT] cityoflondonschool.org.uk . 53. iGEM Conecta: spreading Syn-Bio to Spanish-speaking community. Collaboration description: Spanish language is spoken by more than 400 million speakers around the world, spread out across South and Central America, Spain and in many US states. All of this makes Spanish the second most spoken language. However, almost all iGEM information is largely written in English. Valencia UPV iGEM team, with other Spanish-speaking iGEMers collaborators, wants to launch iGEM Conecta, a Youtube channel with Syn-Bio and iGEM ithemed videos, with the aim of providing society a Syn-Bio background in Spanish. If you are interested in collaborating with this proposal, contact us by our mail (valencia.upv.igem [AT] gmail.com) or by our social networks (Facebook, Instagram or Twitter). PS: It does not matter if you are in a non-hispanic team, you can also collaborate with us! Collaboration description: We have designed a survey to increase our understanding of public opinion on antibiotic resistant bacteria and synthetic biology. Distribution internationally will help us determine if opinion varies based on geographical location. Such information can increase appropriate education on the two topics. Kindly fill out our survey, and pass it on to your peers, family and friends! If any one is interested to over express certain genes in plant/bacterial system. He/She is most welcome to collaborate with our team.We have designed such synthetic promoters that might express in plant/bacterial system much efficiently. Looking forwards to hearing from you. Hey, we are OUC-China! This year our project is about the efficient use of cellulose, which has always been a hot issue. We focus on our local environmental problem---the cellulose of algae is quite a serious pollution source. At an average salvage of 70,000 tons a year, government here in Qingdao makes much efforts not to affect the sailing and marine landscape. Before us, some biological companies only used the Enteromorpha as fodder. Thus, we plan to endue it some new meanings. Through our investigation, water eutrophication can be the main cause of the Enteromorpha outbreak, which leads to red tide, algal bloom and so on. We suspect that there may be many similar environmental problems around the world, so we would like to ask you to help with our questionnaire. In order to explore it in a global range, we will need to know about its origin and utilization in your countries and consequently make a map of distribution of it. If you have similar local ecological problems, we look forward to collaborating with you on such a meaningful event! In addition, we would really appreciate it and mention your help in our wiki if you can collect some local information and send it to us! Hope you can fill out this survey，Thank you for your help! We are working on creating a worldwide data base containing environmental hazards caused by heavy metal pollution, treatments to control it, heavy metal content standards in water / soil, the real amount of heavy metal ion in it, as well as the public awareness of heavy metal pollution etc. We can’t be glad enough to communicate with you if you want to share any information. We have established an alliance, which is led by iGEM Tianjin and joined by SJTU, UCAS, SCUT, XMU, JLU, FAFU, with the common aim of searching、gathering the data and co-constructing the data base. We are planning to have another video conference as soon as we build up a worldwide-web. We are looking forward to hearing from you. As we all know, iGEM is not only about conducting experiments but also about introducing synthetic biology to the public. We believe the core of synthetic biology is the process of "design thinking" and it is worth sharing with everyone. Since 2017 is our 11th year participating in iGEM, we decided to celebrate by hosting an iGEM NYMU-Taipei 10 Year Exhibition. This exhibition will last from September 4th 2017 – September 17th 2017, held in our school, to present projects of NYMU-Taipei from the past decade, and analyze how topics and thinking process evolved over these past ten years. Most importantly, we want to show every visitor how iGEM affected Yang-Ming iGEMers. In addition, we would like to reach out even further and invite teams to share their team history. We are interested in how team members got together and how they decided on their topic. You can include your team history information on your wiki page, facebook, or twitter using the hashtag #iGEMTeamHistory. This experience of looking at our past historys would be extremely beneficial to future iGEM teams. Team UChile_OpenBio-CeBiB invites you to practice your Spanish and to collaborate in a virtual meet up with all Spanish speakers. We would like to discuss all our projects and receive and give lots of feedback!! Also, if you want to attend in person you are very welcome to stay with us! This year, the University of Sydney iGEM team is working on creating a thermostable, single-chain insulin which we hope to produce in a cost-effective manner. We hope that this insulin would be accessible in regions where insulin availability and affordability is currently an issue. Through this survey, we would like to learn more about how easy or difficult it is to obtain insulin in different countries around the world. If you or anyone you know is dependent on insulin, we would like to hear about your experiences with obtaining insulin. From the responses obtained in this survey, we hope to gain a better idea of the challenges facing insulin access on a global scale. We look forwards to hearing from you! Our team project this year focuses on open culture in industrial fermentation process. And we hope to invite teams working on fermentation to have an online meetup with us. We can help to get some advices and solutions from fermentation factories. We are deciding to hold a virtual meetup for teams of specific tracks. The theme of the online-conference this year is Clean Water, Better Environment and You, and we want to invite teams working on water pollution to join us. If your team is in the track of Environment, working on water pollution or similar project, just contact us and join the online-conference! Team Location: Indian Institute of Technology Madras, Chennai, India. We are building a database of chassis organisms and hope to improve the experience of synthetic biologists working with novel organisms. Kindly fill out our survey and tell us about the chassis organism you are putting to use for your project. The survey is at: https://goo.gl/forms/ifVPtPkPLW2ngfY63. If any team wants to send their plasmids for a check, or test their app in another country for validating their project, feel free to contact us via given email address. We'll be more than happy to collaborate. If any team needs help in wiki design or human practices for their iGEM project, please feel free to contact us. We’ll be more than happy to help! This year, Newcastle iGEM team is making a development platform for biosensor production. We are looking for teams who are developing biosensors and would be interested in using our platform. If your team has a functional biosensor system, you could send it to us and we will generate many variants of your biosensor, including different coloured outputs and sensitivity tuning. This would be a two-way collaboration: we would provide you with data for multiple biosensor designs, whilst you would be providing us with a functioning detection module for us to further characterise our system. Look forwards to hearing from you! 37. Design a digital maze for our robot. As we are finishing our lab work, we need to validate the functionality of our experiments. A little robot has to find its way out of a maze. Now here is the point where we want to integrate you in our project. To proof our concept, we need a lot of different mazes to improve the algorithm. To design and build these our computer scientiests have programmed a software tool you can easily use as long as you have an internet connection. If you are interested, please contact us via email igem.nawigraz@ [AT] mail.com to get the details. Here at Oxford we're lucky to have access to lots of different equipment, and we want to share it with you! We can do flow cytometry and fluorescent microscopy very easily in our lab - and if there's something else you're looking for, we may be able to help there too. We are also able to offer help on modelling, such as sensitivity modelling or stochastic modelling. If there's anything else you think we might be able to help on, please ask. We aim to engineer E. coli to assimilate ammonia from air. Such engineered cells can be used to deodorize chemical laboratories and washrooms. For this, we wish to measure ammonia in different places that are rich in ammonia, for which we require your help. The assay procedure is quick, simple and sensitive and will enable us to test the applicability of our device. Hello, we are the US_AFRL_Carrollhs team! We are a new high school iGEM team and share a passion in science. For human practices in order to accomplish connections with other teams, we are using the method of Flat Stanley which is a book written by Jeff Brown. Flat Stanley is where you connect with other people (teams) by sending out a paper person (microbe) across the world by mail (email). Our team has created a colorful, creative microbe and would love for your team to participate in the project by taking pictures of the microbe. Below on the email is an attachment of the microbe. If you like to participate with the Flat Stanley project, please print out the microbe in the file and take pictures with it in your lab or with your team. You can either email, tweet, or tag us in Instagram or Facebook with the photo’s your team has taken. We are using the hashtag #LittleSnazzyMAn. We can’t wait to see the creative photo your team takes. Our PCR-experts team created a masterplan and a first aid service for all kind of PCR problems. If you have trouble with your PCRs don´t hesitate to contact us, we can probably help you to making your PCR run. Just send us an email with your primers, templates and problems you faced in former PCR runs or a parcel with your template and primers and we will send back the PCR product to you. We have made a survey to investigate the public's views on genetic modification to produce medicines. We would love for your input, thank you! We've found editing the wiki to be slow and at times frustrating. In response to this we have have developed a tool called the iGEM Development Environment (IDE). IDE replicates how your iGEM Wiki page will look locally without the need to upload repeatedly to the iGEM website. The benefits of this is that you can create and very quickly edit your wiki locally and see how it would look without going through the process of editing through the iGEM Website. There are also no surprises when you upload to the iGEM Wiki, your wiki pages should look exactly how you see them through IDE. If you're interested or need some general help with your wiki please get in touch with us! In our project we aim to prevent the onset of allergies and autoimmune disease by inducing “immune tolerance”. In the lab we intend to fight our body’s innate intolerance; outside we want to fight human intolerance. We are asking other iGEM teams to help us combat intolerance globally! With this challenge we aim to promote our project idea and help spread our message of tolerance. 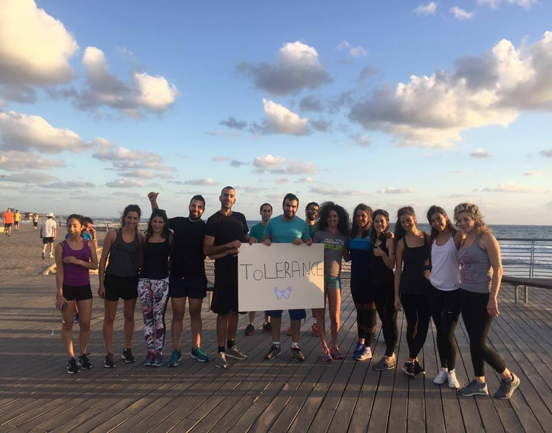 Please post a picture of your team holding a sign with the word “Tolerance” on it. In the picture please emphasize if possible how tolerance and diversity are relevant to your team (e.g., religion, ethnicity, gender, nationality etc…). Feel free to be creative and bring your team’s spirit into the picture! The team with the most diverse and creative picture will be featured on our wiki page and in our final presentation at the Giant Jamboree! Contact Information: You can contact us via Twitter @IGEM17DUS_CGN, on Facebook, or send us an email: igem [AT] hhu.de . In this year’s project we are working with optogenetics again. Because some of our members already worked in the team from last year and because one of our professors is working in this field, we are very fortunate to profit from their expertise. Of course there are a couple of other teams who are working with optogenetics as well and might not have an expert at their university. That’s why we want to share our knowledge with you! On September 1st we will be hosting a seminar at our university dealing with an introduction into optogenetics. This includes learning about the various optogenetic switches as well as working with them in the lab, and also building or obtaining a light box. We invite everybody to join who is able to come to our university. Of course we don’t expect you to fly halfway across the planet, so we will also document the seminar and organize a skype-conference for interested parties. If you want to come in person, we can provide you with accommodations. If you are interested and want to join us please let us know by the 21st of August. iGEM Team Düsseldorf Cologne 2017! We want to provide a platform where we can mutually understand our projects and even exchange our opinions and suggestions on them. Besides, on this platform we can also provide some local data to improve our mutual projects, thus we can expand our sample range to the whole world. Please send us an email! We are students from Beijing Institute of Technology. Our team IGEM_BIT is now carrying on a liver cancer-related project.In order to make our project better and practical, and we need your help. Please answer the questions in this questionnaire carefully and authentically. Any personal information you give in our questionnaire would not be leaked. We really appreciate your help! Thank you for your sincere cooperation! Hi iGEM 2017, we have gathered information from all past and current iGEM teams about their projects. This CSV will enable you to search for keywords and identify potential collaborators. Feel free to ask us any question. If you would like a copy of this file, please email us and we can send it to you! Collaboration description: We would like to reach out to any team that is using recombinases our would consider using recombinases. We can provide you with several novel recombinase parts and target sites. This would hopefully provide valuable resources to any project taking advantage of recombinases such as Cre, while further demonstrating the utility of the parts designed as part of our own project. We want to know how the importation/exportation of biological material works in your country. This survey will only take a few minutes and we'll appreciate if you can collab with us! This year the iGEM Team of TU Dresden started the iGEM goes green initiative to encourage other teams to consider the environmental implications of their projects. We investigate the ecological footprint of our work as a team, and we want to find ways to reduce and compensate for it. 1. Dedicate a subpage of your team’s wiki to your efforts towards a sustainable participation in the competition. 2. Send us the link. 3. Get the go green logo in return and place it on your wiki. 4. Read our GoGreenGuide and do whatever your team can afford to shape your team’s participation in iGEM in a green way. Our GoGreenGuide is written for other iGEM teams and anyone else who is interested in sustainable scientific bench work. We want to inspire anyone who was not interested before to dive into the topic. Interested in taking part and collaborating with us? Get in contact with us! We are looking forward to hear from you! Collaboration description: Please we would like help with using Cellocad to simulate our project and also interpreting the output of the simulation using the same software. 21. Podcast Series "Science out of lab"
Collaboration description:Through the podcast series, we want to bring science into a social, ethical and environmental context by interviewing, e.g researchers, professors, journalists, industry representatives, public. Our target audience is nonprofessionals and experts alike. Possible topics would be in relation to synthetic biology (eg, DIYbio, ethics, gene drive, design etc). We would like to go global and involve experts and opinions from all over the world. This is where you can come along! If you have ideas of possible individuals (and intriguing topics) for the podcast from your local/national community and would like to be part of educating and spreading the word to the public, then please write to us. The podcast aims to explore how synthetic biology intersects with different disciplines (ranging from engineering, law, business to the arts) by engaging with people active in the field. Our target audience is the general public, ie. people who don’t necessarily have a scientific background but who are curious. We invite you to participate in our mini-series, where we aim to showcase the projects of different iGEM teams through short (~5min) episodes. Please contact us if you are interested and we will get back to you with more information regarding which questions will be asked, and about how the podcast will be recorded and edited. We think that science could be more accessible to the public if it was explained in their mother tongue. Therefore, as part of our collaboration commitment, we propose a translation service where teams can send in their project description and other teams can translate it into their native language. If you want to be part of this collaboration, you can upload your project description in the Central Hub (https://drive.google.com/drive/u/1/folders/0B2T1XzPGc8giSl9meHQ1cDlYSEU). We propose that you write the description in English and make it understandable for people with minimal background knowledge. Try to translate for as many participating teams as possible. When you translated a text, please sign with your team name and language. To let us know that you are participating, please send an email to igem2017 [AT] kuleuven.be. We are looking for teams to collaborate with to create a series of short videos in the style of the Tasty/Tastemade Food Videos! They will be roughly 1-minute long videos on any lab techniques. The collection of the unique short videos will be posted on YouTube for other teams and the synthetic biology community to learn from! The surface of our skin contains antimicrobial peptides that protect it from outside threats, like bacteria and fungi. One of these peptides is called dermcidin and it is naturally present in our sweat. So when you sweat, you increase your protection against infections! We are asking other iGEM teams to take part in our sweat challenge to promote the protective properties of sweat! Post a picture of your team doing something sweaty with a caption and we will award the most creative and hilarious one at the Giant Jamboree. 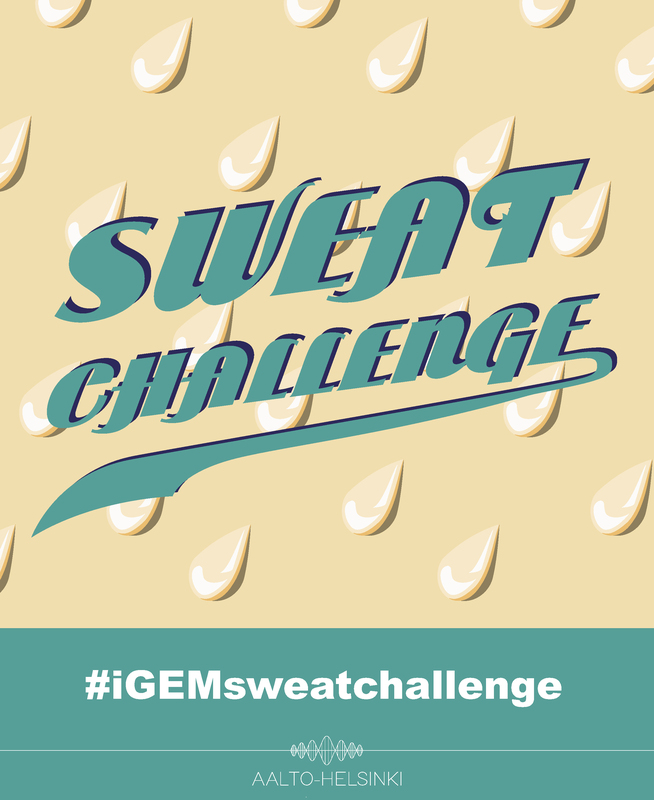 Remember to tag our social media account (instagram: [AT] aaltohelsinki_igem, Facebook [AT] aaltohelsinki and Twitter: [AT] aaltohelsinki) and use the hashtag #iGEMsweatchallenge! Do you believe the quality of the air you breath should be a major concern for all of us? Help us improve it by answering this short survey (3-4 minutes top). Thank you in advance for your help and your time! Tu te sens concerné par la qualité de l'air que tu respires ? Aide nous à l'améliorer en remplissant le questionnaire ci-dessous (3-4 minutes maximum). Merci d'avance pour ton aide et ton temps! - developing one or more new cards. These can be pathogens (like viruses or bacteria), cures (e.g. antibiotic, cough linctus), preventatives (e.g. vaccinations, desinfectant) or just anything that influences human health. The cards should include the name, properties and a short description. - translating the basic deck of cards into their national language, so that the game can be played all around the globe. If you are interested in doing one and/or the other, please tell us before the 1st of August. We would then send you more precise information and some of the already existing cards. Also don't hesitate to contact us, if you have any questions about it! We are very much looking forward to this and would be delighted if many of you join! The CLS iGEM team is trying to create a guide with advice for high school teams on how to get into iGEM, along with helpful tips and some Dos and Don'ts. Entering iGEM can be a daunting task for a high school - without funding, experience or expertise -but we hope this guide will help facilitate new teams and allow them to succeed in their project. We are looking for as many High School Teams to complete our short survey, so we can provide the best advice possible to new teams - with your help, we can help spread iGEM to more high schools around the world. Please take a few minutes to complete our survey - it would be very much appreciated. The survey link is: https://goo.gl/forms/MYDzIEdOqpVTlRwn2. Hello 2017 iGEM teams! Our team this year is working to inhibit methane production in cattle. You can learn more at: http://igem.unl.edu/ or http://2017.igem.org/Team:UNebraska-Lincoln. We have created a quick 10 question survey that we would love for all iGEMers to take. If your team members choose to participate, we will present your team with a badge of contribution. We would really appreciate your time and response! Thank you!! What would happen if you introduced your work to the profit-driven, tightly-regulated world outside of iGEM? As individual teams, we might be able to get a few expert opinions on the implications of our work, but what if we could standardize and share the perspectives and advice we pick up along the way? We want to explore the status of biomanufacturing (that is, using biological systems to produce substances on a commercial scale) as a growing industry around the world. This collaboration effort is relevant to almost any iGEM team, but it is especially relevant to teams on the therapeutic and manufacturing tracks. We are looking for teams interested in assembling a catalog of perspectives on biomanufacturing from leaders in business, public policy, biomedicine, environmental science and material science around the world. We hope to develop a standard set of inquiries and conduct interviews to foster a more thorough understanding of the field of biomanufacturing around the world. We’ll then compile the information we receive, allowing teams to get a better contextualization of their work in the world. We’re looking for teams to contribute to this set of inquiries, and we’re looking for teams to implement them as well. If you would like to get involved with this effort, please email us or reach out on Facebook or Twitter! The concept idea is to create and manage a YouTube platform on which collaborating teams post different kinds of short lab tutorials and link them to their unique iGem project. The videos should promote the main idea and diversity of iGem in the field of synthetic biology. The YouTube channel will reach out to everybody who is not yet aware of iGEM and its possibilities and will consequently encourage and inspire future iGEM teams. A condensed YouTube channel will work as a network and multiply the reach of iGEM teams’ social media presence. we are Vilnius-Lithuania team, and we're interested in virtual meetups to exchange the ideas that our teams are working on and to give and receive critique and other information about our projects. We want to hold as many virtual meetups as we can until Giant Jamboree. The Calgary project this year is using E. coli to convert human solid waste into bioplastics on Mars. Please do contact us if you see potential for wet or dry lab collaborations! Dear iGEM Community, the INSA-UPS_France team created a survey dealing with Vibrio cholerae. In order to get an interesting statistical study we need as much answer as possible. Here is the survey: https://goo.gl/forms/nzqnbNGvTheeHdDz2 Thank you! Our project this year is based on temperature and pH regulated genetic circuits. We are also focusing on a method to convert translational regulation to transcriptional regulation. If any other teams are working on something similar we would love to collaborate with you. Also this year we are working on machine learning that can be applied to the registry of standard biological parts. The software faction of our project will involve building, training and testing a supervised machine learning algorithm on the collection of promoters in the iGEM registry. This algorithm when trained with sufficient data would be capable of identifying novel promoters merely by having the sequence as an input. If any team wants to characterize a sigma 70 promoter as a part of their project, they can use our software. Just email us and we'll do it for you. Looking forward to hearing from any teams interested! We were thinking about constructing a spreadsheet to help organize team lab collaborations if you think that this would be useful and would like to help us develop it further, we would like your input. This is a request for ANY iGEM team. This year, the BU Hardware team is working on an archive that will store different microfluidic chip designs and protocols that we develop. In order to better understand how we can structure this archive to help the iGEM/Synbio community, we have created a short survey that we would like iGEM teams to fill out! You can find the survey at: https://goo.gl/forms/QcGws30fPAcdPi4p1. Thanks! Collaboration description: This collaboration is now fulfilled! This is a request for all IGEM teams working with Lactococcus lactis. As you probably already know L. lactis is an important organism for the fermentation industry and quite easy to modify, making it a promising IGEM chassis. But one disadvantage of L. lactis is its selectivity for promotors and plasmids. Although on the IGEM site many information about the functioning of promotors in either E. coli or B. subtilis can be found this is not the case for our organism. Therefore we propose to collaborate with all IGEM teams working with L. lactis to make a database of existing or new promotors and ribosome bininding sites (RBS) and their effectiveness in L. lactis. We will make a standardized protocol to test the promotor strength using sfGFP (biobrick BBa_K1365020). For the database either existing promotors could be characterized or you could contribute new promotors and RBS, which are not yet in the iGEM distribution kit. We think this collaboration will be of great advantage to all teams working with L. lactis now and in the future. So we hope to hear from you! Contact Information: Team Facebook page or email at nyuad.igem [AT] nyu.edu. Being located in the Middle East, we have found that there are very limited resources available for rising scientists. We are fortunate to have well-stocked lab and involved PI’s aiding us in our journey, but we recognize that not all teams in this region are able to benefit from feedback due to the disparate spread of iGEM teams. Hence, we would like to reach out and hold a virtual meetup for other iGEM teams wherein we can present and receive feedback on our work as well as troubleshoot some problems we may face. This would be organized via Skype and by time zone. If you are interested in joining, please let us know as soon as possible! We will organize a meeting as soon as we have enough interest, and we are open to holding multiple meetups over the course of the year. Contact Information: You can contact us via Twitter @IGEM17DUS_CGN, on Facebook, or send us an email: igem[AT]hhu.de . As we all know iGEM is not only about labwork but also about bringing synthetic biology closer to the public. To do so last year’s iGEM team of the Heinrich- Heine- University of Duesseldorf started a campaign to promote synthetic biology in public using self-designed postcards. Seven other German teams decided to join us and the postcard exchange was a real success. Thrilled about the outcome of last year’s postcards, this year we would like to reach out even further and spread iGEM postcards all over Europe! The idea is that every participating team designs a postcard which shows an image related to synthetic biology, maybe even your topic, on the front and a small informational text on the back. Afterwards a batch of each team’s postcard is exchanged so that every team can share postcards from all over Europe with the people in their neighborhood and at public events etc. If you want to check out last year’s campaign, visit the wiki of Duesseldorf 2016: Postcards. If you are interested and want to join us please let us know until the 30th of June, so we can figure out how many postcards each team should print!